The Juvéderm® products offered at BAXT CosMedical® include Juvéderm® Ultra XC, Juvéderm® Ultra Plus XC, Juvéderm Volbella® XC, Juvéderm Vollure™ XC and Juvéderm Voluma® XC. Juvéderm® is manufactured by Allergan, the makers of BOTOX® Cosmetic. These FDA-approved products are designed to restore the youthful facial skin that has been diminished by age and other skin changes. At BAXT CosMedical®, Dr. Rebecca Baxt and Dr. Saida Baxt advise their facial rejuvenation patients that they have an excellent variety of dermal fillers, including, including the newest addition to the Juvéderm® XC collection of fillers, Juvéderm Vollure™ XC. We invite you to schedule your consultation to determine if Juvéderm Vollure™ XC is right for you. Why Choose Juvéderm Vollure™ XC for Your Facial Rejuvenation? With optimal treatment. Results may vary. Juvéderm Vollure™ XC uses a special technology, called VYCROSS® which works to hold the hyaluronic acid together into a more cohesive gel. Dr. Rebecca Baxt and Dr. Saida Baxt explain that the VYCROSS® technology allows the filler to be more effectively molded to maximize the lift to the treated area and help to keep the filler intact after it is injected into the target facial area. What Area of The Face Can be Treated with Juvéderm Vollure™ XC? The most common area of injection is in a man or woman’s nasolabial folds, often referred to as facial “parentheses.” As we age, our skin begins to lose elasticity and wrinkles and folds develop. Many people try to use over-the-counter face creams and serums to help reduce the appearance of wrinkles. However, these products only work on the surface of the skin and they don’t correct or “fill-in” the wrinkles and creases. 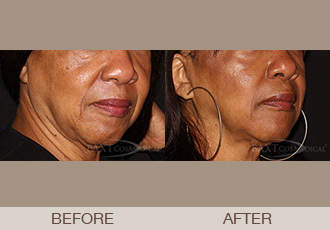 Juvéderm Vollure™ XC adds volume to correct and smooth the lines and folds. How Soon After My Juvéderm Vollure™ XC Injections Will I See Results? Both Dr. Rebecca Baxt and Dr. Saida Baxt advise their patients that Juvéderm Vollure™ XC is an excellent filler which smooths deep wrinkles for a refreshed look. An increasing number of women and men are asking about injectable medications to address facial lines and wrinkles and restore their face to a more youthful appearance. In fact, the use of dermal fillers has increased at a tremendous rate. Due to this demand, many physicians and nurses are taking weekend courses on where to and how to inject dermal fillers. But, should you trust your face to an injector with limited training? Would the wiser choice be to select a board certified dermatologist who has spent years of education and training specializing in the area of medicine concerned with the health and diseases of the skin and hair, nails, and mucous membranes? A dermatologist is a specialist who understands skin and facial anatomy. If you are looking to refresh your appearance and want natural results, schedule a consultation with Dr. Rebecca Baxt or Dr. Saida Baxt. Both are board certified dermatologists and each can help you to determine which facial filler will best achieve your facial enhancement goals. Dr. Rebecca Baxt and Dr. Saida Baxt advise their facial rejuvenation patients that the Juvéderm® collection of fillers can help correct facial lines and wrinkles. We invite you to schedule your consultation to determine if Juvéderm® Ultra XC, Juvéderm® Ultra Plus XC, Juvéderm Volbella® XC, Juvéderm Vollure™ XC or Juvéderm Voluma® XC will work for you. *Results may vary for different patients and are not guaranteed. Source: Based on clinical research conducted by Allergan, the parent company of Juvéderm®, documentation shows that Juvéderm Vollure™ XC is proven to last up to 18 months.